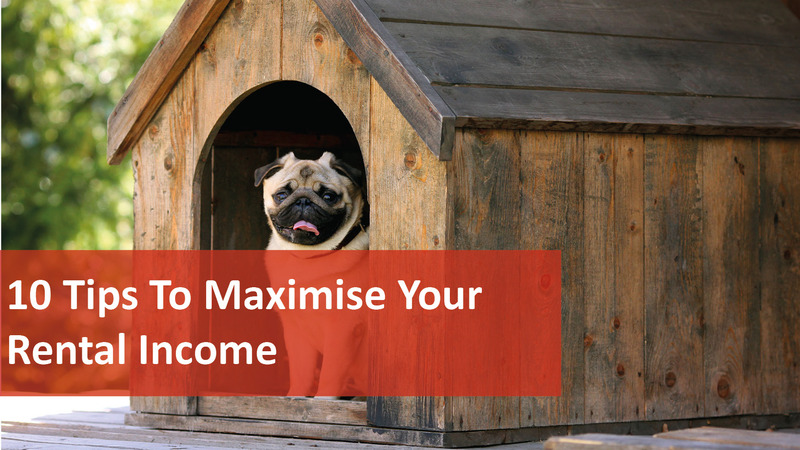 10 Tips to Maximise Your Rental Income! In today’s tough market of low rents, it’s more important than ever to get the biggest bang for buck and maximise the return of your assets. Here’s a list of 10 ways to hopefully stack the odds in your favour! Rents need to increase to keep up with inflation. If your rent is tracking backwards, it’s because of increasing supply out-pacing demand in your area or most probably lack of investment. Cosmetic touches lift rent and equity at the same time. Paint, carpets, blinds and light fixtures can really transform your property and give you a great boost to cash flow as well as some depreciation benefits too. Wherever possible, the longer commitment of 12-month leases are best to reduce downtime in your cashflow, compared to 6-month leases which may leave you high and dry with vacancy periods. Professional photos advertising your property, feature property status putting them on page 1 of the most dominant portals and showing your property 3 times a week at tenant-friendly times (times when employed people can make it to the inspection) will be a good start. This one is a little bit counter-intuitive but it means you will have much better enquiry and therefore a range of tenants to choose from. If you have only one application did you pick the tenant or did the tenant pick you? This can really solve two problems. The neglect of the outdoors of your property (remember street appeal counts) and a higher market rent with a tax deductible expense. 56% of Australians have pets and 25% are considering getting one in the future – do you really want to exclude that many people? By considering pets in the equation you may have more prospective tenants to choose from. Rental properties can be like rental cars in the fact they get driven hard. A good tenant is worth their weight in gold – keep them, appreciate them and consider rewarding them. It really is half the battle. The difference of being ahead of the curve or behind is huge. See why we’re different at We Love Rentals®. Furnish – very niche, very transient tenants more vacancy and more maintenance. Short term lets – more vacancy, more costs. Price the rent for what you need to pay mortgage – the market decides the appropriate rental – not you. Get involved – keep at arm’s length – use a professional Property Manager. Self-manage – it’s harder than you think! Good Property Managers make you money. Let your leases expire at quiet times of the year like around Xmas time. Be the smartest person in the room – take feedback and advice from your trusted team of advisers. As always, the friendly We Love Rentals® team are here to help, give us a call on 08 6254 6300 if you have any questions about your investment.